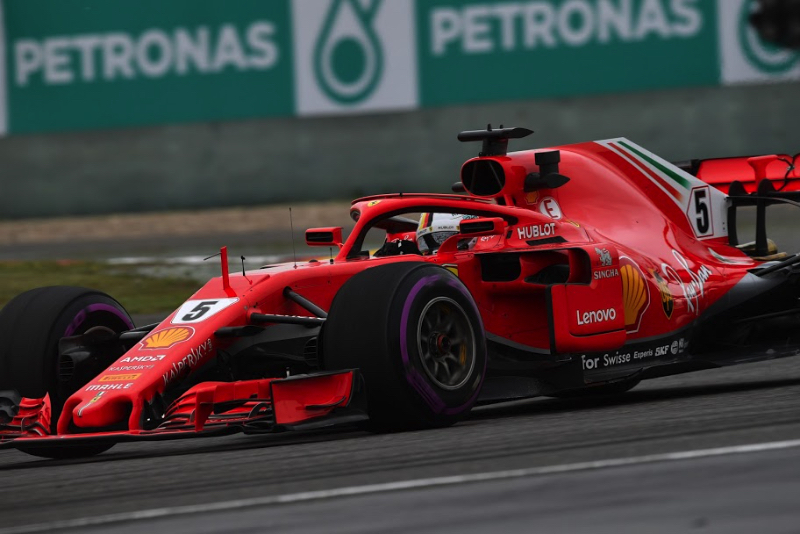 Ferrari locked out the front row of the grid after Sebastian Vettel and Kimi Raikkonen qualified first and second for the Chinese Grand Prix. It was the first all-Ferrari front row since the 2006 United States Grand Prix. "The car was really amazing," Vettel said. "It just kept getting better and better." "It is not exactly what I wanted," said Raikkonen of his second spot. The line-up for the weekend was: Mercedes – Lewis Hamilton and Valtteri Bottas; Ferrari – Vettel and Raikkonen; Red Bull TAG Heuer – Daniel Ricciardo and Max Verstappen; Force India Mercedes – Sergio Perez and Esteban Ocon; Williams Mercedes –Lance Stroll and Sergey Sirotkin; Renault – Nico Hulkenberg and Carlos Sainz; Toro Rosso Honda – Brendon Hartley and Pierre Gasly; Haas Ferrari – Romain Grosjean and Kevin Magnussen; McLaren Renault – Fernando Alonso and Stoffel Vandoorne; Sauber Ferrari – Marcus Ericsson and Charles Leclerc. Vettel cleaned up in FP3, turning a 1:33.018, which was a full second faster than Hamilton. Ricciardo had had an engine failure in FP3, and Grosjean had had brake woes. So their crews had work to do during the two hours before qualifying began. The ambient temperature at the start of qualifying was 54 degrees Fahrenheit (12 degrees Centigrade) and the track temperature was 59 degrees Fahrenheit (15 degrees Centigrade). And the gusty winds continued. Getting temperatures into the tires would require several laps. Raikkonen set the early pace with a lap in 1:32.474. Bottas and Hamilton could not get close to that. But Vettel could as he clocked a 1:32.171. And then Verstappen split Bottas and Hamilton. With five minutes to go, Sirotkin was 15th and on the bubble, with Vandoorne 14th and Hartley 16th. With three minutes and 11 seconds remaining, Ricciardo finally drove out of the garage with the new engine fitted into his car. He would get just one timed lap. He did a lap in 1:33.827, which put him 14th so he just made it into Q2. The five drivers who were eliminated at the end of Q1 were: Sirotkin, Gasly, Stroll, Leclerc and Ericsson. The fastest 15 drivers who moved on to Q2 were: Vettel, Raikkonen, Bottas, Verstappen, Grosjean, Hamilton, Sainz, Magnussen, Alonso, Perez, Hulkenberg, Ocon, Vandoorne, Ricciardo and Hartley. Some of the top teams would try to do their Q2 laps on the soft Pirelli compound tire rather than the ultra soft, thus those drivers could start the race on the soft tires. Indeed, the Ferrari and Mercedes drivers all headed out on the soft tires at the start of the 15-minute session. Everybody else was on the ultra softs. Raikkonen clocked a 1:32.286, which was 0.099 of a second quicker than Vettel, and 0.402 faster than Ricciardo. Bottas was fourth ahead of Verstappen and Hamilton. Just past the midpoint, Perez was tenth and on the cutline, ahead of Sainz but behind Ocon. On the last set of runs, Raikkonen was on the ultra soft tires as did his teammate. Hamilton had another set of the soft Pirellis. He did a 1:31.914, which put him first. Bottas moved up to second. Both Ferrari drivers pitted without improving their times, so they would start the race on the more durable soft compound tires. Tenth place changed several times. Finally, the five drivers who were eliminated at the end of Q2 were: Magnussen, Ocon, Alonso, Vandoorne and Hartley. The fastest 10 drivers who moved on to Q3 were: Hamilton, Bottas, Raikkonen, Vettel, Hulkenberg, Grosjean, Ricciardo, Verstappen, Perez and Sainz. Q3 lasted 12 minutes. Would it be Ferrari or Mercedes on top at the end? It was, of course, now ultra soft tires all round. Raikkonen struck first in the inter-team battle with a time of 1:31.200, a new qualifying lap record. Vettel could not match that with his 1:31.161. Bottas grabbed third with a 1:31.625 and Hamilton fourth with a 1:31.675. Verstappen, Ricciardo, Hulkenberg, Grosjean and Sainz rounded out the top nine, and Perez did not do a flying lap. So it came down to the final three minutes for the final laps of qualifying. Bottas did not improve. Hamilton aborted his lap. Raikkonen got down to a 1:31.182, and moments later Vettel earned his 52nd pole with a lap of 1:31.095. So Bottas and Hamilton would line up third and fourth, with Verstappen and Ricciardo fifth and sixth. The same top six as in Bahrain. Hulkenberg, Perez, Sainz and Grosjean rounded out the top 10.